Preheat the oven to 190°C, gas mark 5. Meanwhile, line a muffin tin with 12 large muffin papers and set aside. In a large bowl, combine the flour, baking powder, bicarbonate of soda and salt, then stir in the sugar, walnuts and muesli. In a separate bowl, mix the eggs, oil, honey and bananas. Tip the wet ingredients into the dry. Mix until combined, but do not overwork. If the mix is a little stiff, add 1 tbsp milk. Spoon the mixture into the muffin papers, filling them 3/4 full. 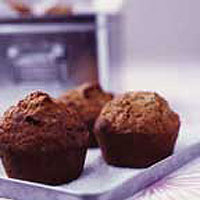 Bake for 25-30 minutes or until the muffins are well risen and coloured golden brown. To test if they are cooked in the middle, insert the point of a knife or a skewer: if it comes out clean, they are ready. If the muffins are still sticky in the middle, bake them for a few more minutes. Eat these on the day you bake them.